We offer a variety of services from home remodeling to general home maintenance and repairs. At Distinctive Contracting, we take pride in producing quality work at competitive rates. 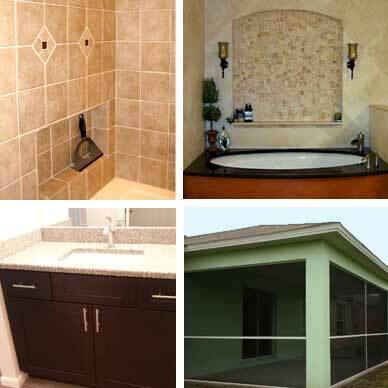 Distinctive Contracting LLC is a State of Florida Licensed building contracting company. We are an insured contrating company and have been servicing the Cape Coral and Fort Myers area for nine years. Our goal is to make the remodel process simple, easy and hassle-free. We seek to keep you up-to-date with the progress and eliminate "surprises" that can occur during a home remodeling process. We understand that ensuring a smooth remodeling process for your home is important to you and is directly related to our future success. At Disctinctive Contracting we invite you to compare our quality and value. Our difference starts from the foundation up, we use quality methods and materials during the entire remodel process. It's these details that make your home remodel last for many years. At Distinctive Contracting, our goal is to provide you with great quality and value on your complete home remodel from the inside out including all the features you may not be able to see. Interested in remodeling your Cape Coral home? We would love to meet with you and show you firsthand, the Distinctive Difference. Contact us today to discuss your next project at 239-677-1247 or email us. View a sampling of our home remodeling projects in our photo gallery. Just click to see our home remodeling gallery.